We join Rosemary, our local monitoring and liaison officer, on her visit to Kwa Iddi, a township not far from the hustle and bustle of Arusha, as she’s sees the impact our small grants and loans programme for women with HIV has had on recipients. From the rice paddies of Masaranga, to the cabbage fields of Olmiringiringa from the kiosks of Ngaramtoni to the bustling market of Kwa Sadalah – I spend several days a month together with either Erneth or Glory, the Mondo Area Co-ordinators, meeting new recipients, sampling the food they serve in wayside cafes, buying their vegetables and occasionally buying some new or second hand clothes. Today I am off to Kwa Iddi with Erneth Manundu, the Arusha Area Co-ordinator, to meet Justin Mollel, the Kwa Iddi Community Co-ordinator. He is well known in the Kwa Iddi area as is involved with many community projects, not to mention teaching in the church. Grants and loans were given out in March 2017 and so the recipients have had several months to settle into their work and build their businesses. I am excited to see how they are getting on! Kwa Iddi stretches from the main Arusha – Nairobi road several kilometres from the centre of Arusha. Here narrow rocky tracks climb towards the lower slopes of Mount Meru. The tracks and trails pass a mixture of large properties with imposing gates, to smaller houses, to boarding houses past fields full of ripening maize. The air is fresh and the sun is shining – a good day to visit. We start along the Arusha – Nairobi road where Naishiye David has her kiosk. Although the neighbourhood does not look very busy, as we sit and talk people pass frequently on their way to and from work, there are plenty of customers. Naishiye’s business is based on her kiosk, a fairly ordinary metal cage well stocked with a variety of fresh fruit and vegetables. Naishiye tells us that she has some regular customers but that the more profitable part of the business is supplying vegetables to local hotels and cafes. She has been working from the kiosk for three years and has used her savings and a separate loan to build 3 shops next door to the kiosk. This is when I begin to see that she has plenty of business plans. The shops are now ready and one is rented out to a grocer. At present she is paying back the loan on the shops but Naishiye is looking forward to the day when she can start another business in one of her own shops. She would like to trade in maize, maize flour (sembe), rice and beans but this will require a lot more saving. She also has plans for her house which is directly behind the kiosk and shops. It is a spacious plot with a traditional mud brick house where she lives with her husband, 7 children (one adopted) and her mother in law. In the yard she also keeps 5 goats but they have been taken out to graze. We say “kwaheri” to Naishiye and move up the hill a little way. We find Sekunda sitting on top of a huge pile of chipped stones. 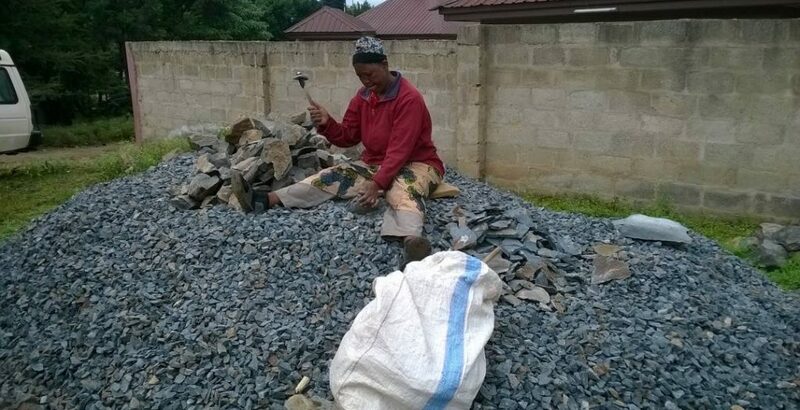 Her job is to transform a huge pile of rocks into chippings for building. It is hard work. A delivery of stones costs 115,000/- and after two weeks she has enough chips to fill three 7 ton lorries and will receive 160,000/- for each load. From the stone piles we walk across a vacant plot to the house that she rents. A gate leads into a passage way and her two rooms lead off the passage with a wooden door at the end. There is a flurry of activity when she opens the end door and chickens fly out of the coop. 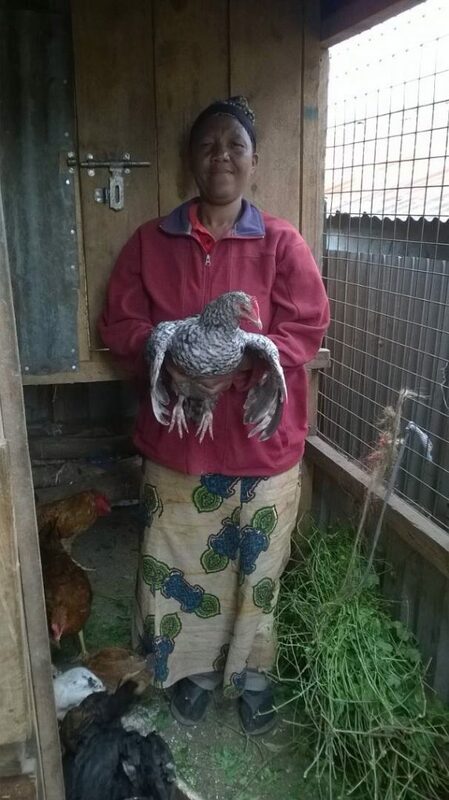 Sekunda started her chicken business some time ago but the chickens were stolen and she decided to save up and spend money on a secure coop. Behind the wooden door she arranged for two separate spacious, airy, enclosures to be built for the chickens. There is an area for roosting and another for laying. It was a large investment but her chickens are safe when she is out chipping stones. Her dream is to build or buy her own home (plots nearby fetching 3+ million shillings) but in the meantime she stays in her two rooms with two of her 5 children, her other children have moved away as they begin their working lives. Look out for the second part of Rosemary’s story, due to be published in a few weeks!